The explosion took place in Fruite Mandi near Hazare gunji in Quetta, killing 16 people including 2 children were killed and 30 injured. Prime Minister Imran Khan, Chief Minister Balochistan Jam Kamal and Chief Minister Punjab Usman Bukhdar condemned in severe words.According to news sources, a blast occurred in Farhat Mandi near Thani area of Thani area, people were busy buying a shop in Mandi at the time of the explosion. 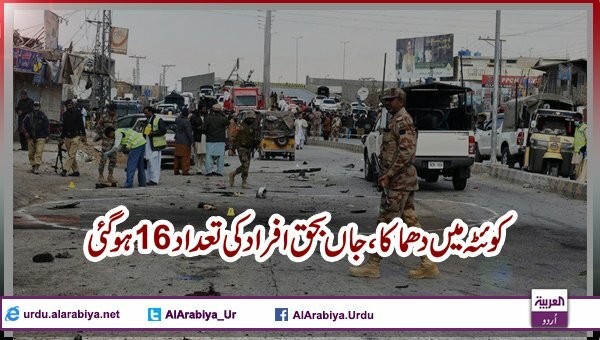 According to the DIG Abdul Raziq Cheema of Quetta, 16 people including 16 children were injured in the explosion. 8 belong to the Hazara community in the blast. The security forces were reported to be in the spot when the blast was reported and surrounded the whole area.Emergency was implemented in the hospitals, killed and the injured were shifted to the nearest hospital. The injured were moved to Civil Hospital Quetta and Bolan Medical Complex. According to the MSN's Civil Hospital Quetta, the blast killed 16 people and injured about 30 seriously, the condition of 3 persons was worried. Prime Minister Imran Khan asked authorities to report a Quetta blast and directed the injured to provide the best medical aid.